My wife and I found the tent easy to sent up and take down. During the time we were there it was exposed to winds in excess of thirty miles per hour. The tent never wavered. The vestibule system worked well. With the double doors, even with the blowing sand, it was easy to get in and out of the tent without letting sand in. I have spent quite a bit of time camping in this area and have never had a tent that let this little sand in. 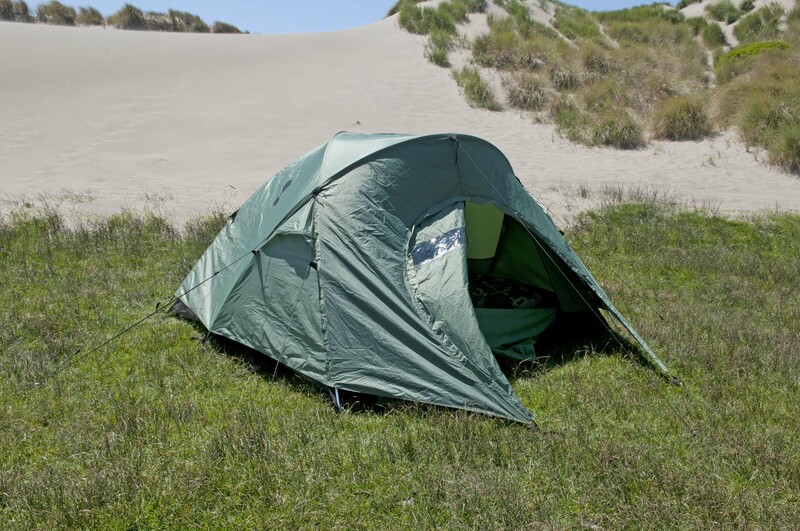 The tent is sturdy, has great tie downs and is well ventilated. You can open both the front and back letting air in through screened windows. It also has two triangular shaped vents near the top that can be opened from the inside. These vents can be used in a heavy rain without letting water enter the tent. The front vestibule door features UV and cold resistant window that I found very functional, it let me check the weather without opening the door. While the tent is advertised as a four man tent, we only had the two of us sleeping in it. This left us with lots of extra room for gear and to stretch out. The tent closed up for bad weather, notice the window in the front vestible door. The only negative that I found was the tent pegs. Mine came with two types of tent pegs both plastic and metal. The plastic worked fine. The metal are light weight, but bend easily in soft ground. I will use this tent again, but I have added a few extra tent pegs. The basic design on this tent is taken from one that is currently used by the Marine Corp. I guess this is where the name the Assault Outfitter 4 came from. Don’t let the name fool you this is not a tent made for just the wannabe Rambo’s. It is also a great tent for families, winter camping or preparedness. Finding a Good Location to Permanently Bug Out To. This entry was posted in Shelter and tagged Eureka Assault Outfitter 4, Howard, shelter, tent. Bookmark the permalink. To echo your comments, a friend of mine has this exact tent and loves it.